Rasmalai is a popular dessert made of fresh paneer (Indian cottage cheese). Today's recipe is comparatively easy and saves a little time. A baked desi Rasmalai version using Italian Ricotta Cheese. Crush cardamom seeds in a mortar pestle. Finely chop pistachios or any nuts of your choice. Heat milk in a heavy bottom vessel. I used whole milk. Keep stirring after every few minutes. Cook at low heat until milk is reduced to half. Continue cooking until you get the desired consistency. Add 1/4 cup sugar, half of the cardamom powder and saffron. Turn off the heat when sugar dissolves. Let this sweetened milk cool. To save some time, you can use store bought Sweetened Condensed Milk and dilute it with milk, until you get the desired consistency and sweetness. In a mixing bowl, add ricotta cheese, 1/4 cup sugar and half of the cardamom powder. Mix well. I used part skim Ricotta Cheese. In case you are using full fat Ricotta Cheese, baking time may vary. For baking, I used a muffin tray. No need to grease the tray. Divide the ricotta cheese in 8 parts and add it to 8 muffin cups. Level each one with a spoon. You can use a rectangular baking tray and cut the baked ricotta cheese in squares. Bake for 25 - 30 minutes or until ricotta cheese looks pale yellow. Also, the edges will look slightly brown because of sugar. Let it cool completely. In a serving bowl, add the baked ricotta cheese. Pour the sweetened condensed milk and refrigerate for about an hour. Rasmalai tastes best when chilled. 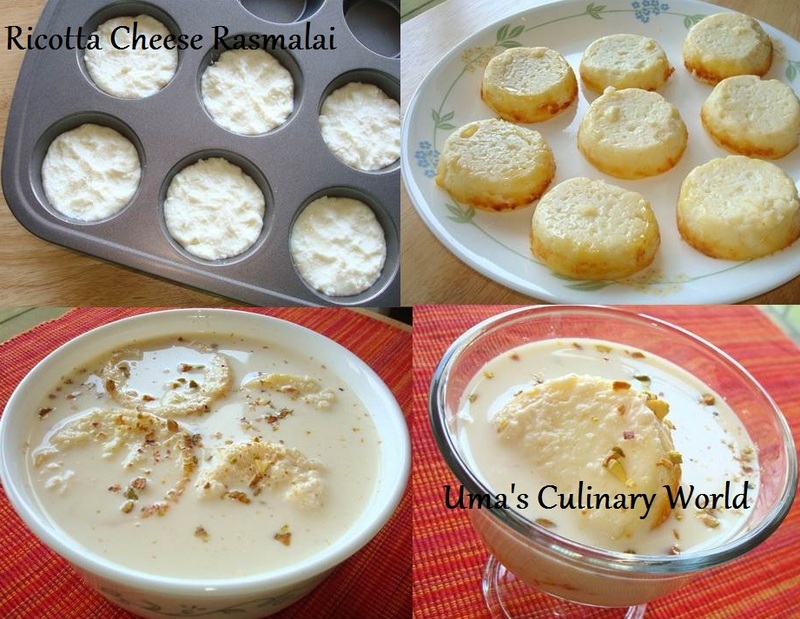 Garnish with chopped nuts and Ricotta Rasmalai is ready to devour. Irresistible and loving this short cut rasmalai.